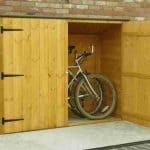 Offering 6 x 3 of space the Shire Wooden Bike Shed / Store is a strong, reliable and fantastic looking way to make sure that your bikes are kept secure and safe from the elements and opportunists. Your bikes will remain rust free when you store them here because that pent roof will make sure any rain that does fall onto it will just roll right off the back, making sure your bike is protected inside. The tongue and groove shiplap cladding is well crafted, made from some very high end wood and as well as having a high quality look will also assist the roof in keeping the rain out and last for many years. 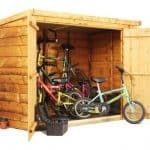 One thing’s for sure about this shed and that is your bikes will be in very safe hands when stored inside. This is a shed that has a very strong 34 x 34 mm frame to really make it so this is going to last you for many years. The whole design of this shed has been all about making certain that anything that is stored inside here will be kept safe and that it will serve as a very good addition to your garden. 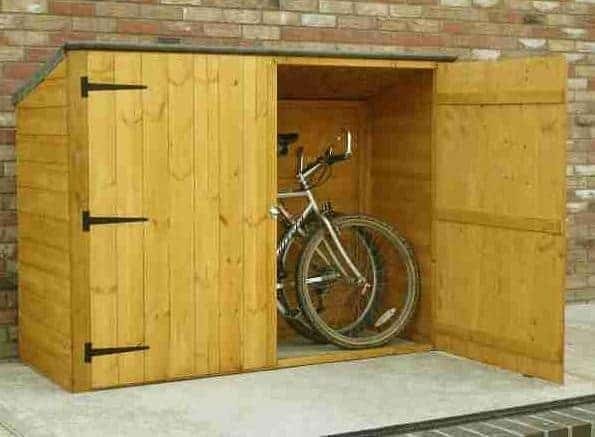 Shire have made a wonderful place to store your bikes and other items inside with this lovely, wooden bike shed. This shed has just such a great look to it and it fits snugly up against any wall, surface or in any other kind of space and just blends right in. At the highest point of the shed there is 4 feet 6 inches so getting your bikes in is no trouble. 6 feet 2 inches of width along with 2 feet 6 inches of depth make it so you can easily fit a few bikes in here and keep them safe from the weather. The shed has a very classy golden brown colour to it which is just such a universal colour that we honestly think this shed could fit into any style of garden. This bike shed / store has a pent style roof and this is perfect as it will keep the rain from pooling on top of the shed as the slanted design will make it run straight off. To help keep you bikes and items in top condition there is some roofing felt which can take anything the weather can throw at it. Underneath the felt covered pent roof we have some good quality, 11 mm thick roof boards which are strong enough to take the weight of snow or even for you to put your helmets, bag and other biking equipment on as you are placing your bikes inside. We really like this roof as it does exactly what you want a roof to do and that is keep the rain out, but it does it with some very classy style. For the cladding, Shire have made sure to use some very attractive looking and reliable, 12 mm thick, tongue and groove shiplap cladding. We feel this is one of the best styles of cladding for not only giving a very structured and smart kind of look, but for most importantly of all, keeping the rain out of it. Shire clearly knew that this shed would be taking a bit of a beating over the years with people putting their bikes in and pulling them out, so with this in mind they chose a cladding that is durable and up to the task of taking a hit from bikes for many years. We are pleased with the choice of cladding and are sure that this will be a shed that will last for a long, long time. While that tongue and groove shiplap cladding is strong in its own right. To make sure the whole structure stays firm for many years there is a good, solid and long lasting frame holding this all together and we absolutely love it. The frame is made from some very good wood and is an impressive 34 mm x 34 mm and we feel though this frame is going to be still incredibly strong more than a few years down the line. The flooring in here is easy to talk about because there is none. Now before you turn up your nose, let us tell you this is specifically by design. Shire know that the last thing you want to do before you put your bike away after a long, hard ride is to clean it to stop mud getting all over the shed. Well by not having a floor you never have to worry about mud ruining the floor or causing any damage. Now the Shire Wooden Bike Shed / Store does come delivered to you with a base coat of treatment, but you will still want to treat it yourself once you have built it. We feel – and actually Shire themselves recommend – that you treat the shed once per year to help keep it in good shape and make sure you get many years out of it. In all honesty, treating a shed of this size does not take much time at all. You get a standard one year warranty with the shed and this will cover you in case anything goes wrong with the actual materials during that first year. This is a decent enough warranty and as long as you look after your shed we do not see you having any problems with it. Getting your bike into the space as easily as possible was clearly one of the driving design choices behind this shed. We say that because the double doors on this shed are huge. With both doors open, you have just an incredible, 1712 mm of room in the width and 1345 mm in height to get your bikes in and out. This is an ideal size for adult bikes as well as kids bikes there will be no hassle getting your equipment in here that is for sure. The door comes with a hasp and staple door lock, and to make sure that these double doors never start to fall out of place each door has three high quality hinges that have a black finish to them. The whole idea of this shed is to keep your bikes as safe and protected from opportunist thieves as possible, so for that reason there are no windows on the Shire Wooden Bike Shed / Store. The hasp and staple lock is practical, but to really make sure your bikes or other belongings are safe and sound you will have to buy a padlock. The good thing about a hasp and staple lock is that it really could not be any easier to add a padlock and it is cheap as well. There is absolutely zero privacy concerns with this shed. There is no window for prying eyes and when those double doors are locked up tight, no one can guess what you have inside here. Shire themselves do not offer any customisation options with this shed, but there are a couple of things you can do yourself. The most obvious one is that you can actually treat the shed with a treatment that is coloured so you can give the shed your own personal style and make sure that it is looked after in the process. We are very happy with how well made and designed this shed is. Shire have managed to make a shed that is very strong, but also make sure that it will be a pleasant addition to your garden. This wood is built to last many years and the way that the shed has been designed makes for one very sturdy structure. A structure that we feel will probably outlive the bikes that are being kept safe inside it. Of course this depends on the bikes you have, but you can easily fit a few bikes in here and be able to get them in and out without any kind of fuss. To make this easy and safe, we recommend having a friend to help build the shed. It is not too much of a hard task and with the easy to follow instructions should take a couple of hours. At under £150 this is an incredible deal. 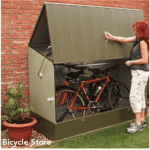 Even if you did not use it to store bikes, we feel that this would make for a very reliable and long lasting shed to store a few gardening items in. 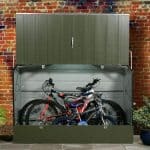 Final Thoughts: We had to double check the price of this bike shed a few times as £139.99 is just such a great deal for a shed that is not only a very reasonable size, but also made from such high quality materials. No one wants to have their bike get ruined by the rain or have the kids bikes strewn across the lawn. 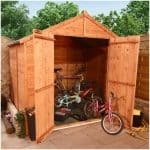 This shed offers a cheap, reliable and long lasting way to make sure your garden is free from bikes being left out and also that the bikes will stay in good condition. 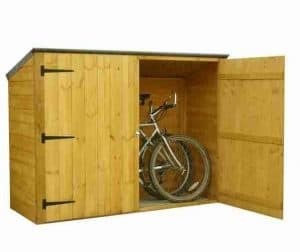 We feel that this is a very good shed and something that if you are looking for a way to safely and securely store your bikes, would be a great purchase. It needs a floor you still have to clean muddy bikes otherwise no point storing them dry some of the competition do this with a floor for just a little more money! ! !